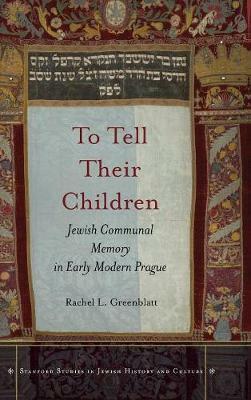 This book offers an examination of Jewish communal memory in Prague in the century and a half stretching from its position as cosmopolitan capital of the Holy Roman Empire (1583-1611) through Catholic reform and triumphalism in the later seventeenth century, to the eve of its encounter with Enlightenment in the early eighteenth. Rachel Greenblatt approaches the subject through the lens of the community's own stories-stories recovered from close readings of a wide range of documents as well as from gravestones and other treasured objects in which Prague's Jews recorded their history. On the basis of this material, Greenblatt shows how members of this community sought to preserve for future generations their memories of others within the community and the events that they experienced. Throughout, the author seeks to go beyond the debates inspired by Yosef Hayim Yerushalmi's influential Zakhor: Jewish History and Jewish Memory, often regarded as the seminal work in the field of Jewish communal memory, by focusing not on whether Jews in a pre-modern community had a historical consciousness, but rather on the ways in which they perceived and preserved their history. In doing this, Greenblatt opens a window onto the roles that local traditions, aesthetic sensibilities, gender, social hierarchies, and political and financial pressures played in the construction of local memories.